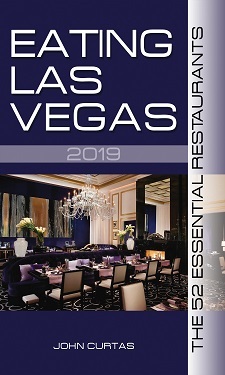 About once a year — usually when we’re gearing up for the next edition of EATING LAS VEGAS – The 50 Essential Restaurants — we drop by Michael Mina (the restaurant, not the man) to taste perfection on a plate. These days, the kitchen is being helmed by a young Turk named Benjamin Jenkins, and we’re happy to report nothing has changed in the perfection department; the caviar parfait is still as creamy, crisp and salty as ever, the tuna tartare puts all others to shame, and the rest of the menu — be it a gorgeous, flaky Steelhead trout with English peas, or a lobster tortellini napped with a tangy, citrus brown butter — shows a deep, abiding respect for the character of its main ingredients without ever overwhelming them. That, my friends, is what seasonal perfection in restaurant cooking is all about, and Mina and his minions get it right just about every time. The only problem Michael Mina (both the man and the restaurant) has is being taken for granted. Both have been so good for so long (approaching fifteen years in Las Vegas), that they now seem like part of the furniture….if that furniture were hand-crafted, perfectly balanced and finely engineered to obsessive specifications. His steelhead trout (not pictured) with English peas, pickled radish and ramp butter is case in point. No longer is Mina trying to dazzle diners with cartwheels from the kitchen. Gone on the trios and pirouettes on the plate. In their place is a very seasonal fish, with two other standard bearer for this time of year (ramps and peas) each providing a small accent to the fish and nothing more. Instead of swamping you with side dish options, here they present but three — foie gras (black) rice, Spring succotash, and rainbow chard — and each is so shot through with savoriness you will forget that they’re supposed to be a supporting player to the star attraction. You’re tempted to call this food simple, but elegant is the right word — one that still describes the dining room (looking great since 1998) and a service staff that hasn’t missed a beat since then, either. Michael Mina (both the man and the Las Vegas restaurant), are now firmly of middle age, and all the better for it. It remains a superstar in our galaxy of great eats, and, from the look of things, it should be humming along smoothly for another fifteen years. Michael, my boss, would be very suprised when he find out that he no longer own Stripsteak and American Fish. I agree with the consistent (near) perfection on execution, but doesn’t it feel a bit like walking in to 2001 all over again when you dine here? Quiet room, stuffy tableside service, and a menu that really evokes their heyday. Even if it is the best tuna tartare, it’s still kinda like saying I have the most expensive, stylish turtleneck sweater on so it’s still cool. The private luncheon with Chef Mina at his signature restaurant was one of the very few highlights of Vegas Uncork’d 2012. The Pisco Cocktail with fresh Lavendar was tart, sweet and fragrant, the wine service flawless–our glasses never empty. (As opposed to the deplorable wine service at Central). The simple garnish of tart Kumquats stuffed with silky Foie Gras that accompanied the Crispy Roast Duck and Forbidden Rice was the best dish I tasted during my week in town. Of course, I would expect no less from a Chef who hails from the Pacific Northwest. We have a reputation for crafting superior cuisine. One minor quibble to an otherwise great review – the Bellagio (and thus this restaurant) opened in 1998, not 1997. My favorite restaurant in Bellagio. Never have I been let down by the food or the service. MM always delivers, food looks amazing. Glad to see he is switching the menu around. I ate there in Feb specifically because of its review in ELV 2012 and was not disappointed. The lobster pie looked too daunting, so I went with the Jidori chicken with savoy cabbage. The cabbage overwhelmed the chicken which was said to contain truffles but I’m quite fond of savoy cabbage so that wasn’t necessarily a problem. The bartender rose to my challenge and came up with a cocktail (scotch, Barolo, lemon) that blended intriguingly with the cabbagey chicken. I look forward to trying some other Michael Mina restaurants in the future, after appropriate ELV reviews. Make up your mind, one review you talk about how Tuna is the most over played ingredient ever. Now it is the best tartare ever!! Both arrogant and ignorant. Educate yourself please, beyond your feeble bubble. I agree with I Love Adam Sobel. This JC Post was a throw back to 1997, but maybe it was meant as satire also Calling Chef Jenkins is somewhat derogatory. @good chefs everywhere–Anyone with a whiff of what is going on in kitchens across America today would know that it’s neither arrogant nor ignorant to state that Chefs from the Northwest have a reputation for crafting superior cuisine. Try as you will, you’re not bursting my bubble. Should any culinary professional rise to the level of winning a James Beard Award, take a moment before you step to the podium and read Beard’s biography and where he came from. Maybe then the feeble-minded will understand the influence of the Pacific Northwest on cuisine in America. Is San Francisco considered the Pacific Northwest? If not, he only went to primary school in Washington, worked 1 year at the Space Needle, then to Culinary School in New York. After he Graduated he worked in LA before moving to San Francisco to do his thing. Beard’s culinary heritage was rooted in Portland, Oregon, where he was born in 1903. His love of food and cooking was formed early on, largely influenced by his Mother, the family’s Chinese cook and trips to their Summer house at the Oregon Coast. Beard’s Northwest heritage was the foundation of his life’s work. He returned to Oregon on a regular basis after moving to New York, (where I first saw him at the Portland Airport), and did a series of cooking classes at the beach house in Gearhart on the coast. Those of us who are Native Northwesterners hold Beard in high regard for the contributions he made to American cookery and we are proud to say we share our Oregon heritage with him. If you are a student of Beard’s life, you know that without those formative years in Oregon he wouldn’t have risen to be the culinary figure that he became. And getting back to the topic of Michael Mina, my original statement was related to the fact that Chef Mina was raised in Ellensburg, Washington, a farm town in the central part of the state not far from where I live. His first job in a kitchen was in Ellensburg and then he worked in Seattle. And like Beard, Chef Mina’s culinary imprint is rooted in the Pacific Northwest. Argue until the cows come back in the barn about which state or which region of the country produces the “best” Chefs, but that wasn’t my point. The fact remains that, “we, (the Pacific Northwest), have a reputation for crafting superior cuisine.” That doesn’t mean the Pacific Northwest is “better” than anyone else, but it speaks to the heritage and traditions of this part of the country in shaping some of the country’s most talented Chefs and culinary figures.